This is turning into an epic saga. I have a feeling someone, somewhere doesn’t want me to be an amateur drone pilot. Or maybe, someone somewhere is throwing so many road blocks at me to make me prove I deserve to be an amateur drone pilot. Either way, it’s getting seriously frustrating. Way back in the mists of time I ordered a Cheerson CX-35 from a company called Banggood. Delivery was a little slow, but eventually the package arrived and I excitedly assembled the drone. It didn’t work. Having tried different batteries, and fiddled with connectors, it would work if there was an ‘R’ in the month and there was a full moon. In other words, it would work occasionally. Make that very occasionally. 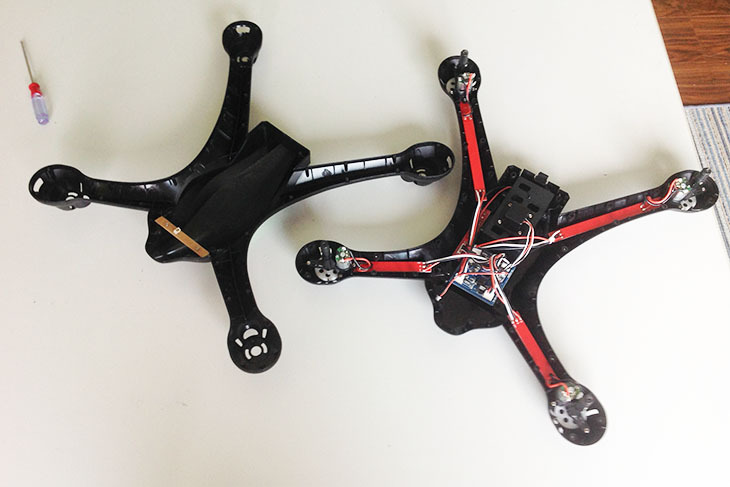 I made a couple of flights, but I was worried it would suddenly decide not to work, and fall out of the sky. Then, it died permanently. I sent a photo. Silence. I sent a video. Silence. Then I said “Why the bleep haven’t you answered my e-mails?” “What e-mails?” they asked. “Send us a video.” Grrr. I resent the video, and after the obligatory wait of a few days they said “Oops, sorry, we’d like to offer you a refund and you can keep the drone.” Well, it was progress, but the refund was only about 40% of what I’d paid. I tried the same thing with the controller. Only four screws. But again. Nothing apparently wrong. With so few parts, I realized there wasn’t much that could be changed, so if I could find a source of spares, then maybe I could swap a few things and get it working. The main logic board, that tiny thing in the center of the drone, the one that has all the software that controls flight and the camera, seems to be easy to buy. And I figured that part probably was the culprit. It’s available for the crazy price of just US$10. Imagine developing all that software and making just ten bucks for the completed board. Crazy. 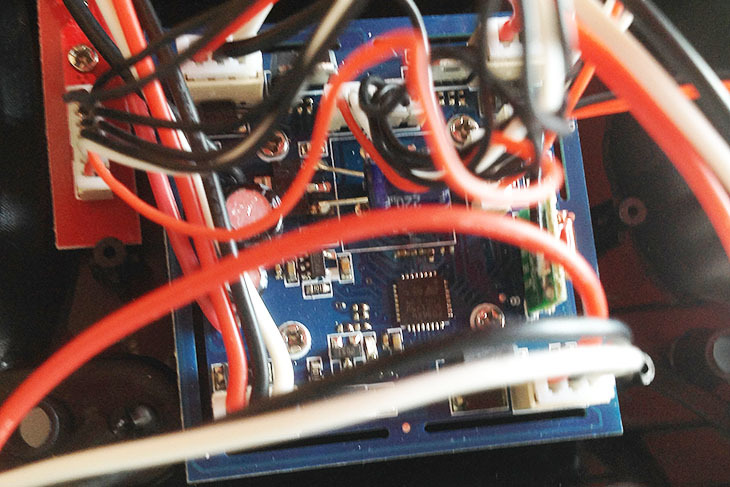 I’ve looked at some open-source drone control software. The part that keeps the thing at a constant altitude, constantly monitoring and making adjustments, would need a few math degrees to code. But based on the stupidly low cost of spares, a refund of 40% didn’t seem so bad. I’d get money back. Hopefully I could fix the drone. And everyone would be happy. Then I decided, no, that’s really not fair. 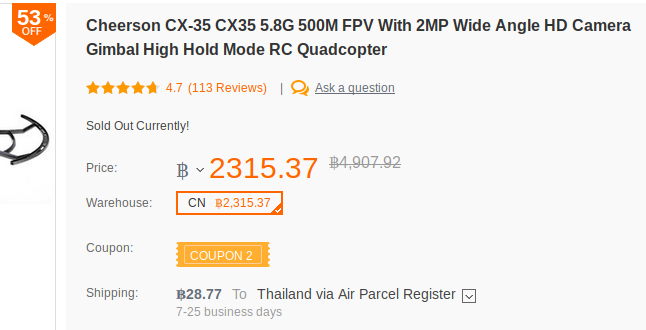 So I told Banggood “When you sell something that’s faulty, you should either offer a replacement or a full refund.” After three days they said “We’d like to offer you a bigger refund and you can still keep the drone.” The new refund was about 70% of what I’d paid, and with drone in hand, I’d at the very least have a full stock of spares, or a drone I might be bale to repair, and I’d get a good chunk of money back – so I accepted. 53% off, but the catch was – they had no stock. I’m no lawyer, but to me, that seemed beyond deception; it seemed fraudulent. Unless, I could buy at that price when stock was renewed. “Because we have no stock.” Duh! About three weeks ago I ordered another CX-35 from a company called Geekbuying. I figured that way I’d have one working drone and a ton of spares. They took my money, and about three days later announced “We’ve shipped.” And they gave me a tracking number. The tracking system said “No tracking information for the shipment, or overdue tracking.” Hmm. That’s not too unusual. It can take a while for the number to get into the system. At least it can in some countries that shall remain nameless. So I waited. I figured 10 to 14 days would be about right from the date of shipment. Nothing arrived, and the tracking number still didn’t work. Another e-mail was needed. In the hope they were not too busy still adjusting their e-mail boxes, I did as requested. Why they could not have simply forwarded my message? … oh, never mind. Too logical. This morning an answer arrived. “Hello, Your package was returned because it’s electric item, custom are very strict with it.” This sounds like a load of hogwash. They should know the rules. They are selling into Thailand so they should know how to get packages cleared. I suspect they do know. I suspect nothing was ever shipped. I suspect the so-called tracking number was a dummy they give to people they think are – well – dummies. What really happened? I suspect that, like Banggood” they didn’t have stock. They asked if I’d like them to resend, or would I like a refund. I wonder what makes them think they’ll be second time lucky? Because they know they’re lying about the first shipment. Anyhoo, I’ll be taking the refund. Are there any companies I can trust? Are they all operated by a teenager with a notebook computer sitting in a 20′ container? While it might seem like the most logical option, I haven’t come this far just to give up. I’ve invested money – although, provided the refunds appear as promised – not a lot. But I have also invested a lot of time. Not only in the failed buying processes, but lots of time reading books & magazines and watching Youtube videos. I wanted to be sure I knew what I was getting into, how I could most effectively learn, and how I could operate a drone safely and not land it on someone’s head. First; I’m not going to place yet another drone order with anyone until I’ve seen the refunds arrive back in my account. 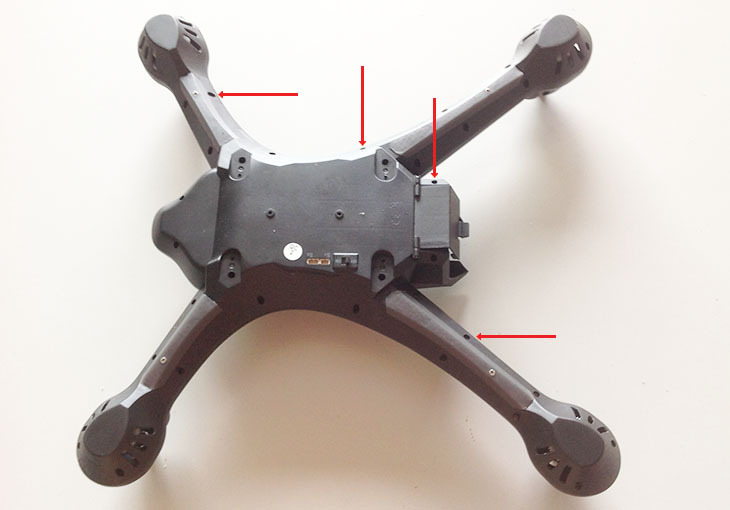 I’m no longer convinced I can trust any sellers, and I’m not going to be out of pocket for three drones. Second; if/when I do place an order, it will be with a supplier in Thailand. I’ve found a reputable one, and even though their price is about 30% higher, I can receive the shipment in a few days without Customs hassles, and presumably any problem resolution – if needed – will be much simpler. At this point, the extra 30% seems like money well spent. And third; I’m going to order a bunch of low cost spares in the hope I can repair the first CX-35.